The Junior Shield final ended in a mass brawl on Wednesday night. An investigation involving the PSNI and County Antrim Football Association has been launched after this year’s Junior Shield final was marred by a mass brawl. The behaviour of players, officials and spectators at Seaview on Wednesday night will come under review after violent scenes in the aftermath of the trophy presentation to Suffolk following a 3-1 defeat of Woodvale. “We have been assisting the PSNI as of last night (Wednesday) and will also start our own internal investigation,” said County Antrim FA secretary Bernard Thompson. “We are bound by a procedure under the IFA Disciplinary Code and will follow that process. “Our remit covers misconduct by officials, players and spectators so now it is about gathering evidence to review. Footage captured at the final was uploaded and posted on his Twitter account by ‘J.R AKA Burt’ (@BelfastBhoy88). It is understood that three people suffered minor injuries and police have issued an appeal for witnesses. 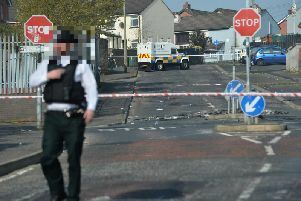 “Police in North Belfast have received a report of an altercation after an amateur football match ended at grounds on the Shore Road on the evening of Wednesday 26 April,” confirmed the PSNI statement. “The match between Suffolk FC and Woodvale FC was taking place at Seaview. “Anyone who attended the match and witnessed the incident is asked to contact police at Tennent Street, on the non-emergency number 101 quoting reference number CC 1213 26/04/17.